The music of Bratko Bibič is paradoxical: simple and complex, serious and funny, cerebral and silly. Tender melodies, pure as folk songs, are embroidered with wordless jabbering vocals and strange sound effects. A tune goes around in a circle, hypnotically repetitive, then shoots off in a different direction. Rhythms swerve, stop, and start. A clarinet wails, a violin murmurs and squeals, a music box tinkles. At the heart of it all is the accordion: Bibič plays with the many different sounds the instrument can make, from the roar of the full-throated reeds to the breathing of bellows without keys and the voiceless click of keys without bellows. 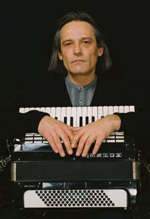 The Slovenian accordionist has been playing solo and in groups since the 1970s. He was a founding member of the influential Ljubljana-based band Begnagrad, and later joined the international group Nimal. He most recently came to international notice as a member of Accordion Tribe, the quintet of accordion all-stars that has toured European twice and recorded two albums: the self-titled Accordion Tribe (1996) and Sea of Reeds (2002). One of the most memorable cuts in the Tribe's first recording is Bibič's haunting tune " Šackamra" ("Aus der Schatzkammer des Unbewussten," the Freudian term meaning "from the vault of the unconscious"). "Squeeze That Light Metal Music"
But his most intriguing explorations in the past few years have come with his ensemble the Madleys. The group began in 1995 as a trio – Bibič's accordion, Bogo Peč nikar on clarinet and baritone saxophone, and Matjaz Sekne on violin and viola. Since then, the Madleys' lineup has expanded to include bass player Nino de Gleria and drummer and percussionist Aleš Rendla. With this formation, Bibič developed a score for his film project, Na Domačem Vrtu (In the Family Garden), a 45-minute compilation of silent-film clips from the Slovenian Film Archives. A CD of this score, with some additional material, was released in Slovenia last year. 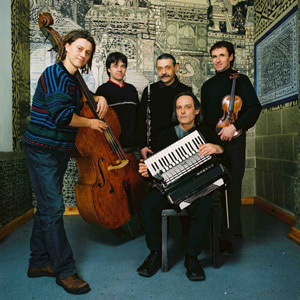 In September 2002, Bibič and the Madleys made their US debut at the Chicago World Music Festival, where they played a short concert as part of a ten-hour music marathon at Symphony Center. The next aft ernoon they provided live accompaniment for a screening of Na Domač em Vrtu. It's safe to say that most people in the capacity crowd at Symphony Center didn't know what to expect. Bibič's recordings are difficult to find in the US, and the setting of the World Music Festival, with its wall-to-wall folk/ethnic bands, misled some into thinking that the Madleys were going to play Slovenian folk music. (It probably didn't help that that's how they were described in the concert program.) At least one concertgoer seemed to be in the wrong auditorium – when the Madleys were introduced, a woman next to me turned to her companion and said, dismayed, "I thought these were the Brazilians!" As if to set everyone straight, Bibič and the Madleys opened the set with one of his more challenging modern pieces, a bold bit of clangor. (The woman beside me was greatly alarmed.) Having gotten everyone's undivided attention, Bibič continued with mat erial that was more melodic and less scary, but just as absorbing. Among the pieces were "Tangue," a deliciously sultry tango, and "Madley," which sounds like a couple of different tunes chopped up and stitched back together into a crazy quilt. Most of the music revolved around the interplay of the clarinet/sax, violin/viola, and Bibič's accordion, with Rendla's drums and de Gleria's bass backing it up with a quiet, subtle energy. When called upon, however, the drummer and bassist let it rip, unleashin g the full power of the band. At the end of the set, the band tore into "Majava (The Pendelling One)." A high point of the Na Domač em Vrtu CD, this is an exhilarating roller-coaster ride of soaring clarinet, gypsy violin, and jagged Balkan dance rhythms. It brought down the house. Even the woman next to me was shouting and applauding. She appeared to have forgotten about the Brazilians. The Madleys convened again the next day at the Gene Siskel Film Center for the screening of the film. They were introduced by a local public-radio host who said they were from Slovakia. A man in the audience corrected this faux pas while the Madleys looked on in amusement. As the film rolled, the musicians, tucked away in a corner in near-total darkness, began to play, watching the screen attentively. An interesting aspect of live accompaniment is that, while the band is playing along with the film, they, like the audience, are observing what is happening on the screen. They are in the unique position of being betwixt-and-between – part of the audience as well as part of the show. The first images in the film are from the early part of the 20th century: little girls playing in a garden, a woman in a long dress carrying a baby. The girls run laughing toward the camera. Then, some footage shot from a train: a blur of trees and train tracks flashing by in an overlapping pattern. Then, surprisingly, New York City. A Slovene went to America in 1930 and brought his movie camera, capturing the skyline as it looked before it was taken over by glass-box skyscrapers. There are typical tourist shots: the Statue of Liberty, old Penn Station, the Brooklyn Bridge, people waiting for a train. Other clips from "home movies" include scenes of Germany in the 1930s. In one shot, hundreds of people line the roads to see Hitler drive by. A disturbing subtitle: "Hermann Goering gets married"(!). The flow of images continues with a sequence of a dancer with a tambourine; two cheerful alpinists having beer in a café and looking at a map; and a lengthy excerpt from the first color film made in Slovenia, showing the inside of a steel factory, workers silhouetted against flat orange light. The montage effect, with bits taken out of context, leads to some amusing irony. One clip from a propaganda film shows a cross being smashed. It turns out that it's not Communist propaganda, however – it's from a film made by Catholic Workers Against Communism. The film ends with a long sequence of one of the alpinists climbing a mountain. There's something poignant about the image – as the world edges closer to war, some seek refuge and fulfillment in nature. Throughout the film, Bibič 's score includes both incidental music and evocative sound effects. In the factory sequence, for example, the grinding and scratching of machinery and the sizzling of molten steel are imitated by percussion, accordion and a piano (played by Sekne). There are occasional comic moments that elicited giggles from the audience: Pečnikar playing a music box with demure gravitas, Bibič's accordion launching into a spasm of heavy breathing, thanks to clever use of the air button. When the lights went up, Bibič spoke to the audience and answered questions. He gave some background for the film clips: the little girls were the daughters of the "father of Slovenian film," Karl Grossman, who filmed them in his garden in 1906; and the mountain-climbing sequence was from a 1931 dramatic film, "Zlatorog (Goldhorn)." In answer to a woman who asked if the score was all Slovenian folk music, Bibič patiently explained that no, in fact the pieces were his original compositions, done in a mix of styles. And while they occ asionally included sounds that come from folk music, there were no specific folk motifs. After all the questions had been answered, someone in the audience asked Bibič to play more music. A chorus of agreement broke out - "Yes please, more music!" Bibič and the band graciously responded with an encore of a few pieces from the previous day's concert. Outside at the theater's box office, the few available copies of the Na Domačem Vrtu CD were instantly snapped up. While the film was interesting enough, it seemed that the music was what affected the audience most deeply. Later, I talked with Bibič while he relaxed with a beer. He has a Gothic Renaissance face, his austere, almost grim features framed by longish hair (he could have posed for Riemenschneider as a worldly priest), but behind this stern look is a droll sense of humor. I asked him, was the heavy-breathing accordion supposed to be funny? "Why not?" he said. "Somehow it is. You play with the source of the sound. The sound of the source of the sound!" He grinned in delight. "I like jokes anyway. Even if it's not intended, if it comes out like it is, I'm happy with it." He added dryly, "As soon as they stop laughing, we're in trouble." His love for wordplay is evident in the band name "Madleys," which he explained as mad + medley. He sometimes bills himself under the nom de guerre "Bridko Bebič ," which derives from the Slovene words "bridko" (bitterly/painfully), and "bebič " (imbecile). At university, Bibič studied philosophy and sociolo gy, and spent six years doing research on these subjects. But music was always part of his life. "I was doing music all the time, all along. My first important gig was in 1972 – not accordion but harmonica. It was huge, a rock festival in Ljubljana. I played there in a trio with a guitar player and a percussionist. I was 16 years old. And there were 5000 people there." He laughed. "I haven't had that large an audience since then." I asked about the origin of the Madleys and why he expanded it to a quintet. Bibič said it grew out of his solo work in the early '90s. "When I got to make a record, I asked those two guys [Pečnikar and Sekne ] to join. Because I figured, only accordion can also be boring, you know, let's have more. And so, then we started to play live also. So it was just those three guys. And then, two years ago, the drummer joined. In the first concerts touring, it was a quartet, without bass. Then in June of 2000, the bass player joined." "I like the trio formation because it's a kind of chamber thing, and it's more economical," he continued. "But I like bass and drums, and the reason why I expanded to include them, taking on many more problems - economical, logistical, everything for five people - is to get the dance dimension of it. With the trio, that was not so much present. And also to make the relation to rock, because that's also the rock reference, the electric bass and drums rhythm section." This structure harks back to Bibič's experience with Begnagrad ("escape to the castle"), a band that started in the mid-'70s and continued in a second formation into the early '80s. Bogo Peč nikar played clarinet and sax in Begnagrad. In fact, four out of the five Madleys played together in that band – Rendla and de Gleria were part of the second formation. (At that time, Sekne was a member of Srp, another "alternative" band in Ljubljana.) Begnagrad's style borrowed from rock, jazz, folk and classical, but with a fiery, freewheeling originality that was (and still is) nothing short of astonishing. "We played in a rock context which was much richer than you can imagine now," Bibič said. "In rock, you could find all kinds of music, all kinds of stuff happening. It was everything, almost. I grew up with that." Even so, it was somewhat unusual for an accordionist to have long hair and play in a band with an electric guitar and bass. "That was incredible to people," Bibič laughed. "But it wasn't just the accordion. It was the clarinet, too. Clarinet, at that time, was a completely misunderstood instrument. It was just in Dixieland jazz, old jazz. So when we had accordion a nd clarinet, with clarinet playing jazz, that was doubly different." The eclecticism of Begnagrad suited Bibič. "I was interested in all kinds of music," he said. "I used to listen to a lot of classical music. I was improvising on Beethoven. I knew al l the symphonies. But my favorite was Bach – when I was about 12 years old. His organ music. That was my motivation for the accordion. And afterwards, it was Shostakovich. I was crazy about him. The big orchestral pieces, not so much the chamber music. But not only that, I listened to all these strange pieces – Stravinsky, Schoenberg, all this kind of stuff. This was quite a strong line in my music. If you take as an example Stravinsky, it includes jazz, folk patterns, all kinds of stuff. But as a matter of fact, it is a kind of invented music. It's not folk music, it's not jazz music - it's Stravinsky!" I asked him how he became involved in creating the film. He said he was asked by the Slovenian Cinematheque Cinema-Ear program to compose music for a Slovenian silent film, as part of the growing trend of showing silent films with live musical accompaniment. But after seeing what was available to work with, he decided to do something else. "I checked out those long feature movies which had kind of a story - there are only two - and I found I'm not interested enough in them. There are good sequences, for instance, the one showing mountain climbing. But to do one hour and a half would be boring and it would be a lot to play. So I took pieces to make my own kind of thing." Bibič had participated in film and video production before as a composer, and occasionally as co-editor, so he had experience with the editing process. This enabled him to put together a montage of selected images to achieve his particular artistic goal. The current film is actually the first part of a trilogy that he is in the process of completing. As he described it: "Part two and three are dealing with the period after World War II, mostly '50s, and then early '60s. I skipped the wartime, because I don't want to get into the war in this way. But it will be present through how the war was being presented in the '50s in movies. It's more about how war persists in peacetime." Parts two and three will include segments from dramatic films as well as newsreels. However, there are technical issues that will change the nature of the work. "The problem is that after '45, there are no silent movies anymore," Bibič explained. "Therefore I have to deal with what I find silent in the archives - mostly foo tage which was never synchronized. If there is original sound, I won't make it silent. But there will be always the music over it or in relation to it, played at the same time." Because there will be much more sound material, Bibič said, the role of the band will change – hence, so will the music. "There will be more improvisation. It won't be so strictly composed. It will be more free, more relaxed." While Bibič is finishing his film cycle, he is also working on setting up a tour for the Madleys. We may have the opportunity to see them again in the US in the near future. In the meantime, for those who are unable to see them perform in person, their madcap brilliance can be experienced via the Na Domačem Vrtu CD. All Audio is (p)(C)2001 Bratko Bibič, and used by permission. © 2003 RootsWorld. No reproduction of any part of this page or its associated files is permitted without express written permission.